I’ve been working on re-enactments in one way or another since about 1996, when I did a performance work called Cornflakes in Perth. It was, in some way, about the daily re-enactment of getting out of bed and eating breakfast. Another early work, The Peg#24 Pieces (1996), in collaboration with Mick Hender, explored the relationship between performative action and score. In 2002, I conducted (sort of in the way a conductor conducts an orchestra) a re-enactment of Albert M Fine’s Fluxorchestra for 24 Performers. It was part of a project called Bilateral, where I lived in the gallery of the Experimental Art Foundation in Adelaide for the duration of the exhibition. The Fluxorchestra was a classic Fluxus event which had a wonderful series of scores (one for each participant) that could be followed, and drew in many members of the local arts community for a celebration of the absurd. I’d very much like to do it again sometime. 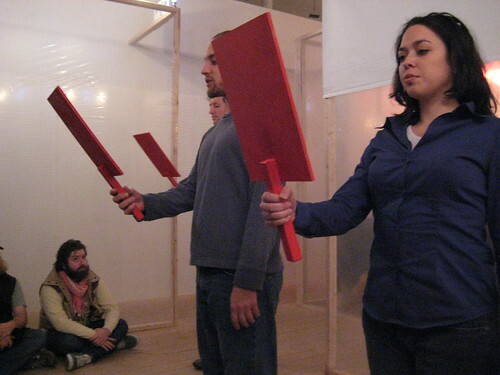 In 2009, I worked with Nick Keys and Astrid L’Orange to re-enact Allan Kaprow’s Push and Pull – a Furniture Comedy for Hans Hoffman – a happening/environment from 1963. This was part of There Goes the Neighbourhood, at Performance Space. 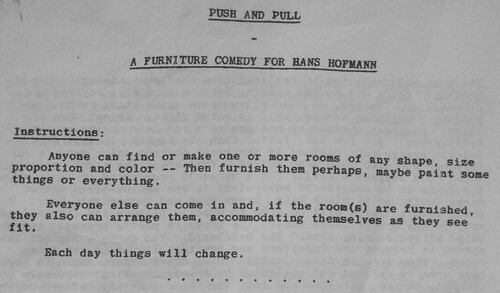 Our version of Push and Pull was documented heavily as a blog. The great thing about this was that the documentation from our re-enactment goes back to the Allan Kaprow estate, where it becomes part of the ongoing narrative about this work. Via Fluxus, I became fascinated with Expanded Cinema, which is a performative branch of experimental film culture from the 1960s. There are significant crossovers between Fluxus, performance art and Expanded Cinema – VALIE EXPORT and Carolee Scheeman being two examples. Working collaboratively with SMIC (Sydney Moving Image Coalition), and in particular with Louise Curham, I embarked on a series of experiments with re-enacting key works of Expanded Cinema from the past. These early attempts (2003-5) were pretty rough but they set us on our path. 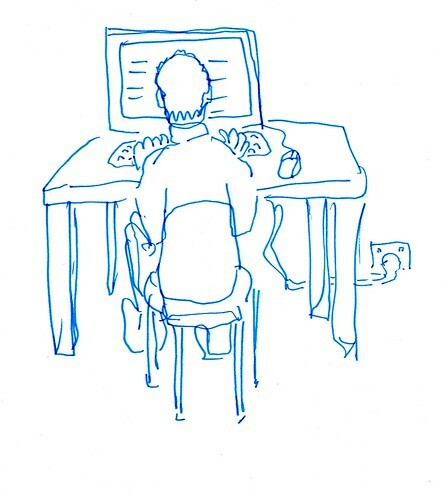 Our later works were very research intensive. Here’s some info about our re-enactment work with SMIC (which we later renamed Teaching and Learning Cinema). Anthony McCall’s Long Film for Ambient Light (1975) (re-enacted in 2007)(about which I wrote a chapter for Amelia Jones and Adrian Heathfield’s book Perform Repeat Record. Guy Sherwin’s Man with Mirror (1976) (re-enacted in 2009-onwards). In May 2013, Louise Curham and I went to London to begin work with Malcolm Le Grice on re-enacting a work of his from 1971, Horror Film 1. This re-enactment will continue to be developed during 2014. This is a fairly clear description of our general work with re-enacting Expanded Cinema. My 2005-6 twin projects, Bilateral Kellerberrin and Bilateral Petersham, were for me an “evolved re-enactment” of John Cage’s 4’33”. In the methodology underlying these projects, I took Cage’s 4’33” as a format or template, and shifted it to my own time and place. While Cage’s piece tends to be performed in a concert hall, and lasts only four minutes and thirty three seconds, my projects took his template into a neighbourhood social sphere, extended the duration to 2 months of my own daily life, and registered the chance occurrences through blogging. (To be clear: at the time, this Cagean connection was not foregrounded publically as the reason for the work’s existence, but was rather an unspoken skeleton shaping my daily practice). In 2011, I began working with Ian Milliss, a veteran Aussie conceptual artist, on a re-enactment of his Yeomans Project from 1975-6. It is in some ways more of an enactment, in that the original work never came to pass back in the 1970s. This intergenerational contact (Milliss, as well as Guy Sherwin, Anthony McCall, etc) is an ongoing part of my practice. In 2012, I convened a panel discussion with Christopher Hewitt and Andrea Saemann, on re-enacting performance art at University of Wollongong. It was part of a symposium called Expanded Documentary. This entry was posted in expanded cinema, Fluxus, performance art, re-enactment, workplace relations on September 5, 2013 by Lucas. This tiny image is all I could dredge up on the web for this wonderful Fluxus performance. It looks like the score used to be available at Printed Matter, but not anymore. I conducted an enactment of this piece in 2002 at the Experimental Art Foundation in Adelaide (precisely, at the Mercury Cinema) – a few notes on the larger project within which the event was conducted are here. For this enactment, I re-typed all of Fine’s scores and customised them a bit for the local context, and I also added in a few extra performers. There’s an individual score, typed up on an individual card for each performer, and each performer is in the dark about what the others are going to do. From memory, there are 24 performers. Each score has a series of numbers running down the page, 1 to 15. These represent minutes. Thus the piece goes for 15 minutes. Each performer has to watch the clock and carry out the relevant instruction as each minute ticks around. If a number has nothing written next to it, the performer does nothing. When I conducted the work, I inserted it as a ‘secret’ piece in the middle of an evening of film screenings called “Film” films? Fine! at the Mercury Cinema in Adelaide. The films shown were Buster Keaton’s Film and Gustav Deutsch’s Film Ist. There were more than 24 people in the audience. Those who were not performers in the Fluxorchestra had no idea about what was going to happen. The event was the aggregate of all the things that took place within that fifteen minutes. It was pretty impossible to document. A video was shot – it’s mainly useful for the audio recording however, as the cinema was quite dark. 3. Yell: “Damn this boredom”, get up and walk out. 8. explode it with a bang if possible. 11. Continue conversation or remain quiet. Burp. 13. it as anything.” Sit in original seat. 14. Take a balloon from pocket and inflate it until it bursts. This entry was posted in collaboration, Fluxus, performance art, re-enactment on June 12, 2013 by Lucas. Last year my friend Kirsten asked me about blogging – about how to go about making a “good” blog. She, of course, has a good blog of her own, but seeing as I’ve done a couple of very intensive art projects which use blogs as their primary medium, I do have some thoughts about the nuts and bolts of making them work. This entry was posted in blogging, performance art, workplace relations and tagged blogging, performance art on April 24, 2009 by Lucas. Thursday morning, 6:55am – Bob The Goat trots into our goat-deprived lives, thanks to the power of good old fashioned broadcast radio. In all the excitement, I almost forget my commitment to the West Brunswick Sculpture Triennial. I’m supposed to make a pennant to commemorate the festival! Friday night, 10:30pm – at Kylie and Damien’s place, Lisa and I set up a little fuzzy-felt sheltered pennant-making workshop. With sharp scissors flashing, the corner of my tongue sticking out of the side of my mouth, and the help of some stinky craft glue, I put together the goaty pennant you see hanging proudly alongside its buddies in the photo above. (The reverse side says, simply, BOB). 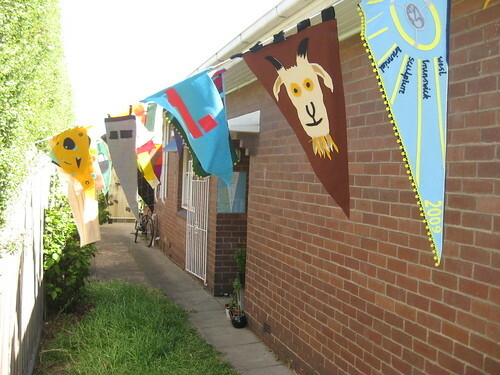 Saturday afternoon, 3:30pm – under the hanging pennants, at 135 Union Street, West Brunswick, a tribe of goat enthusiasts gather expectantly to await Bob’s arrival. We’re about to start the Great West Brunswick Goat Walk! This entry was posted in agriculture, artist run, performance art, public art, spatial politics, walking and tagged brunswick, goat, talking, walking on March 24, 2009 by Lucas. 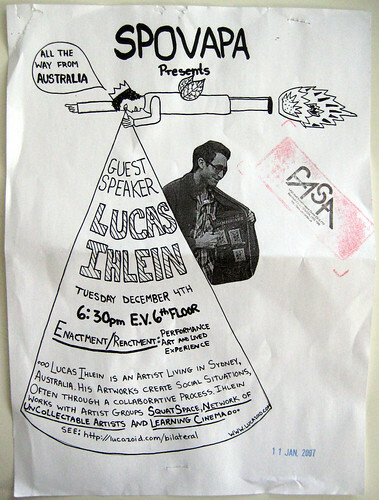 [natty flyer designed by Abe, who organised the talk]. Last night (December 4, 2007) I gave an informal slideshow talk about re-enactment and performance art at Concordia University in Montreal. Abe de Bruyn, an Aussie performance practitioner who I had met in Melbourne a few years back, is studying here now, and has initiated a series of guest lectures broadly on the topic of video and performance art. I collected together a bunch of pictures I took on my recent trip to New York, to discuss re-enacting performance art as a strategy which is relevant to art history, archiving and documentation, as well something which is of social and phenomenological interest. This entry was posted in performance art, re-enactment and tagged 0100101110101101.org, allan kaprow, Brandon Labelle, Marina Abramovic, peformance art, re-enactment, Vito Acconci on December 5, 2007 by Lucas. the following is a cut and paste from this word document here (or here if you want google’s transformation into html). -It’s a spiel and interview about Lone Twin, which was put together by the erstwhile Christopher Hewitt for the 2004 Brussels KunstenFESTIVALdesArts. I’m pasting it here because it’s really interesting, and because there’s not much of this depth available on the web about Lone Twin. This entry was posted in performance art, Writing by others and tagged Christopher Hewitt, Lone Twin, performance art, walking on November 22, 2006 by Lucas. A short while ago I went to Adelaide to run part of a workshop on experimental public art practices. I tried some exercises from Augusto Boal’s book “Games for Actors and Non-Actors”. This entry was posted in performance art, public art and tagged Augusto Boal, Brazil, conflict, performance art, public art, Theatre, Theatre of the Oppressed on November 22, 2006 by Lucas.